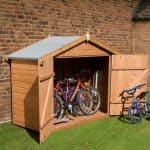 Get a bike store from What Shed and have your cycle protected in exactly the same manner your car is safeguarded by your garage. 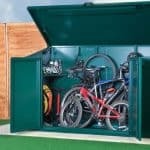 Our solutions can provide your bike with a safe space for storing that’ll ensure the safety of your prized possession from both the weather and unauthorised use. We use only pressure treated timber for our structures, making them virtually impervious to wear and tear and physical damage. The ingenious design and top quality treatment also ensures the weather is repelled and get nowhere near your bike. Reliable locks may also guarantee that the item will remain where you placed it. We also provide windowless options for added privacy. Our bike store can come in several sizes. Whether you’ll need space for storing a single bike or all the family’s cycles, we have several solutions that’ll match your requirements. 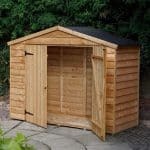 We also provide bigger sheds for motorbikes and big bikes. 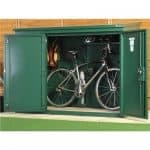 The extra room that is included with these bike stores can be useful for other things such as tools and equipment. We also offer accessories such as shelving and hooks for further organisation. Our bike storage packages have free delivery to all of the UK mainland and we endeavour to include the lowest prices in the market. If you find similar products at cheaper prices elsewhere, please contact as so we can make the necessary adjustments. 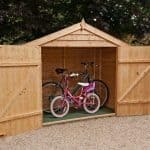 So for the best independent reviews of all Bike Sheds in the UK, from bike storage, bike storage sheds, and right through to plain cheap bike sheds, you are at the right site. All the Bike Sheds for sale will be shipped direct to your door. 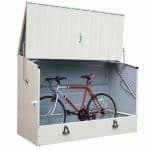 A high quality bike storage unit for a low price, use the opportunity to buy extras and you will have a reliable building that is very spacious and.. 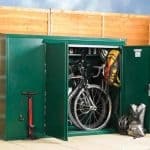 The Hartwood FSC Overlap Timber Bike Store is the ideal place for you to keep your bikes and bicycle accessories safe from thieves and the bad weather. This.. 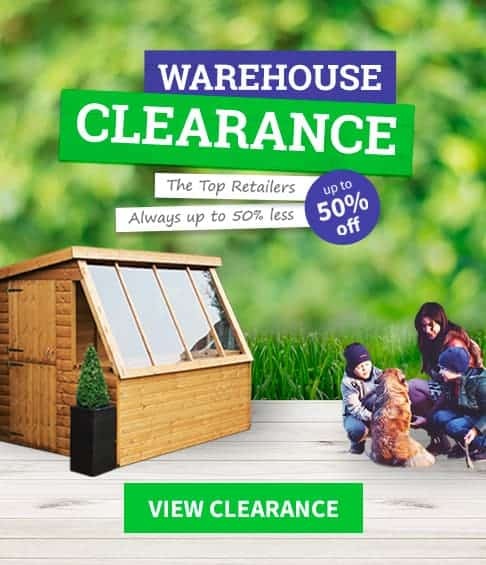 Looking for a 7×3 shed? 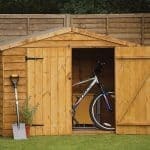 An attractive wooden bin and bike shed that provides a good amount of space without sticking out too much into your garden. Due.. 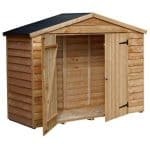 Looking for a Billyoh Shed? 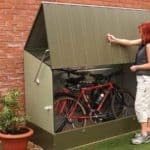 If you require stylish and accessible storage space for your outdoor and garden items, look no further than this bike storage/mini shed. With.. 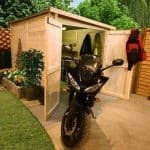 Looking for a motorbike storage shed? Standing at 7x9ft this is definitely one for motorbike fanatics out there. With the ability to hold up to three motorbikes you.. Looking for a BillyOh Apex Bike Store? Store the whole family’s bikes in one place for easy access whether on a daily or more casual basis. This attractive timber.. 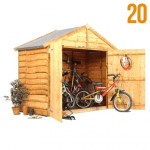 This attractive overlap timber bike store will comfortably fit between two and three adult bikes or slightly more children’s bikes. Whether taking them in and out once a.. 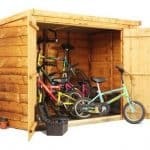 The Billyoh Bike Storage Shed is a great space in which to store the entire family’s bikes, trikes and scooters as well as all the accessories that come..
A super spacious shed in which to store bikes for the whole family. 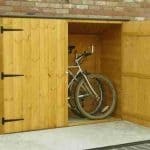 The large, wide double doors make it easy to access and store your bikes on.. 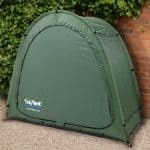 The 6’7 x 2’7 Shedstore TidyTent offers you a very different way to keep your garden free of clutter. No matter if it is things you use to.. 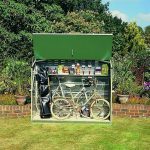 The 6′ x 3′ Asgard Premium Metal Bike Store offers you the most secure and reliable way to keep your bikes safe from the rain and also to..
Offering you a low cost, unique and fun way to keep your garden free of clutter and offer some of your belongings protection from the rain, snow and.. 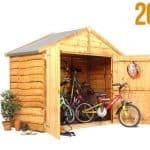 Here we have a very attractive pent roof bike shed constructed from hard wearing and durable wood. It has overlap cladding which gives it strength and longevity. It’s.. This bike shed is a fantastic looking structure with a very stylish rustic design that sets it apart from all the other bike stores. 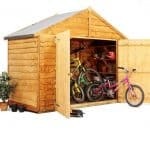 It is a practical,..
Are you looking for a a good sized bike store or even a 4 x 7 storage shed? This roomy, versatile bike shed is a handsome looking hard.. 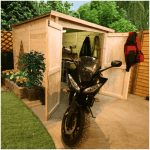 This roomy, versatile bike shed is a handsome looking hard wearing wood shed with some very interesting and unique cladding, rustic overlap tongue & groove cladding has been.. The Blooma Overlap Wooden Bike Store is just as good for storing your gardening gear, tools and the kids summer toys as it is your bikes. It is.. 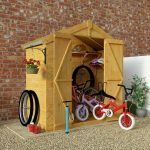 The Blooma Shiplap Wooden Bike Shed is just as good for storing your gardening items, kids toys and a whole bunch of other items as it is keeping.. 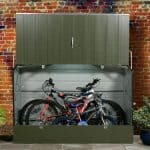 This spectacular metal bike store has an integral metal floor, security padlocks and two stainless steel hasps which will deter burglars and make sure that anything you place.. Plenty of room in here for two adult bikes and more. There are a couple of issues, mainly around customization costs that seem more necessary than a luxury,.. 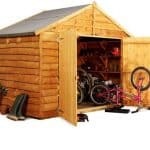 It does not matter if you purchase the 7′ x 3′ Store-Plus Overlap Bike Shed as a way to keep your own or the kids bikes safe or..
Offering 6 x 3 of space the Shire Wooden Bike Shed / Store is a strong, reliable and fantastic looking way to make sure that your bikes are..
You can forget rusted chains, squeaky breaks or the children’s bikes left all over the lawn when you place the 7 X 3 Windsor Overlap Wooden Bike Store.. This is no ordinary bike store. The Trimetals Metal Bicycle Store is high quality in every regard and has been designed so that it keeps your bikes or..
Keeping your bike somewhere that it will not rust and be an easy target for thieves could not be any easier thanks to the 7′ x 3′ Asgard..
Keeping your own bike safe from the elements and making sure the kids bikes or even their toys are no longer scattered all over your garden has never.. Securing your bikes in the garden used to be a matter of just leaving them lying around. But this high security bike store changes all that. It has.. 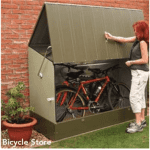 This metal bicycle shed is the perfect place to store your bicycles. It’s incredibly convenient, coming fully assembled and also having two padlock points fitted as standard. This.. This metal storage unit is incredibly useful, and features a completely removable lower front panel. This allows you to have a unit that can store taller items. This.. 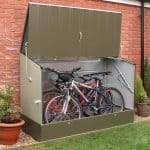 This spectacular metal bike shed has an integral metal floor, security padlocks and two stainless steel hasps which will deter burglars. It also has a heavy duty ground.. If you’re looking for high security then this is a fantastic product as it is the only motorcycle garage which has certificates of level 1 and level 2..
One of the wider and larger bike sheds, this bike shed is a handsome looking rough sawn overlap board for extra strength. Stylish yet functional, it will store.. 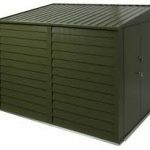 This bike shed is a handsome looking unit available in overlap, tongue and groove or rustic cladding board for extra strength. Stylish yet functional with an apex roof.. 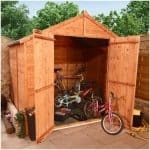 This bike shed is a neat, handsome looking smaller unit available in overlap, tongue and groove or rustic cladding board for extra strength. Stylish yet functional with an.. This type of bike store gives you complete peace of mind; such is the strength of security. Comprising of galvanised metal and rated 9 out of 10 by.. 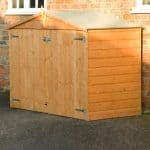 This bike shed is a handsome looking hard wearing wood with tongue & groove cladding for extra strength. Stylish yet functional, it will store your bicycles away from.. 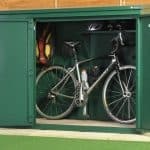 If you need somewhere secure to store your bikes but have limited space then the Asgard Bike Locker is the right choice for you. You simply place your.. If you’re a bike fan or your children spend hours outside riding around then this is perfect for you as it will keep your bicycles clean and dry..